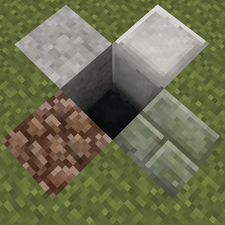 Forges are created by making a 1x1 hole that is surrounded by any combination of cobblestone, bricks, stone, or smooth stone on all four sides and underneath. Either seven pieces of charcoal or a coal block are then placed with Right Click in the hole, and lit with a firestarter or a flint & steel. Using the firestarter may take multiple tries before the forge is successfully lit. Once the forge has been lit it will quickly burn out unless more fuel is added to the GUI. In order to relight the forge, at least one piece of fuel must be placed in the fuel slots, and a firestarter or flint & steel must be used to Right Click on the forge block. Forges must have proper ventilation in order to work. Forges can be exposed directly to the sky for ventilation, but will stop working during rain or snow. Alternatively, a chimney structure can be used to protect the forge from precipitation, while allowing it to still be properly ventilated. The following images are examples of where the air blocks must be in valid chimney structures, where the stained glass represents an air block. 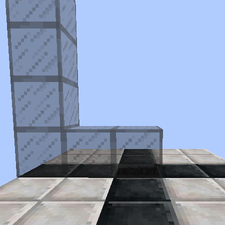 Note that the chimney cannot go diagonally from the forge block. Additionally, the vertical portion of the chimney's air blocks must have direct access to the sky (i.e. assume that the vertical stack of stained glass blocks goes all the way to the world's build height limit in the images). The horizontal line of stained glass can be either air blocks, or any non-opaque block such as bellows or a crucible. Stained glass representing chimney air blocks. Forges are used to heat up items for smithing, as well as for making torches, and cooking sand to make glass. Forges also provide a heat source for crucibles and wrought iron grills. The forge on it's own cannot be used to cook food or to smelt ores. Note: If the player is unable to access the GUI after the forge has been created, it is likely that the forge does not have a valid chimney. Temperature Gauge - An estimate of the current temperature of the forge. Heating Slots - Input slots for heating items. All slots heat items at the same rate. Fuel Slots - Input slots for coal and charcoal. Fuel is always consumed from the bottom center slot, and fuel placed in other slots will move down if the lower slots are empty. 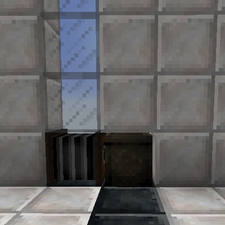 Storage Slots - Input slots for empty ceramic molds to catch molten metal. Items placed in these slots will cool down normally. Forges will gradually heat items in the heating slots as long as it is burning fuel. Items that reach their melting temperature will grab an empty ceramic mold from the storage slots and attempt to place the unshaped ingots in the storage slots. If there is no room in the storage slots, the unshaped ingots will be spit out into the world. If there are no ceramic ingot molds in the storage slots, the melting metal will be destroyed. Items in a forge can only get as hot as the current burning temperature of the fuel. A bellows can be used to increase the current burning temperature at the fuel, and heat the forge twice as fast at the expense of consuming the fuel twice as fast. Note: Bellows only affects how quickly the forge itself heats up. Items heating up inside of the the forge will heat up at the same rate regardless of if a bellows is used or not. When the forge runs out of fuel, the items in the heating slots will start to cool down, and the forge will eventually turn off. Normalized the height-based temperature of the forge to the new map heights. Multiple ceramic molds can be used from a single stack, instead of requiring one mold per storage slot. Added forge sound effect when lit. Removed height factor from forge temperature calculations. Forges can be created by using a firestarter to light a charcoal pile with at least 7 charcoal. Forges are destroyed when removing any of the containing walls. 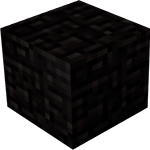 Forges can be created with a charcoal block, or a vanilla coal block. Forges will have a static temperature of 2,000 in debug mode. Large items that return more than one unshaped ingot worth of metal will grab a mold from the storage slots and attempt to place the unshaped ingot in the storage slots. If there is no room in the storage slots, the unshaped ingots will be spit out into the world. Forges currently cannot be accessed for adding fuel once a grill has been placed on top. Therefore the forge should have fuel in all of it's fuel slots and be lit before the grill can be placed on top and used for cooking food. Once the forge runs out of fuel, the grill must be broken in order to access the forge for refueling. The blocks around a forge can be chiseled once the forge has been created, as long as the forge does not receive a block update afterwards. Without a bellows, the highest temperature a forge can reach is within the welding range for all tier 3 or higher metals except for platinum. Therefore the player can leave these metals in the forge without fear of the items melting as long as the bellows is not used. 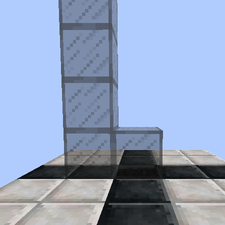 Forges do not take up the full 1m³ space, and therefore will be broken by falling gravity-affected blocks. A mix and match of different stones making a valid hole for forge creation. This page was last modified on 14 March 2015, at 02:32.